Help! I've been sucked into the maelstrom of brutal politics within the Confederation of Democratic Sims (CDS). A few short months ago I discovered what seemed to be the sleepy little virtual democracy of CDS, and took up residence in a corner of the Colonia Nova sim. I was attracted to CDS because it is a democratically-run region, which appeals to my leftist leanings towards all things cooperative. I promptly joined the moderate leftist party within CDS, which is called the Citizen's Social Democratic Faction (CSDF), and settled in for what I expected to be a gentle game of virtual democracy. In fact, I was hoping that others would do most of the democratizing for me, because my main interest was in promoting Ivan Illich's philosophy of convivial tools. Alas, fate has decided otherwise. At first I watched from the sidelines as the political climate within CDS deteriorated. Then I found myself getting pulled into the conflicts as a participant. And now I find myself in the position of single-handedly trying to create a new political party within CDS. How did this all come about? "On second thought, who really needs this?! Y'all have fun! Merry Christmas, Happy New Year and best of luck with your project." Following his departure, Michel's group was re-organized as NuCARE, under the leadership of ThePrincess Parisi. The elections for the new term of the Representative Assembly were carried out during the week of January 14th to 21st, 2008. The CSDF faction received the most votes, followed by NuCARE, but the CDS electoral system is set up such that candidates were elected from all of the four participating parties. The new Representative Assembly was sworn in on February 3rd, as I've told on one of my blog posts. Patroklus Murakami, as leader of the faction having received the most votes, automatically took the role of Leader of the Representative Assembly (LRA). The first meeting of the RA on February 3rd was good-humoured and consensual, but things began to go sour at the very next meeting. The conflict centred around procedural questions. In order to understand the positions of both sides, one must know something about the way the CDS political system was initially set up. The voting system tends to favour small parties, which means that the party that gains the most votes will generally have only a minority of representatives. To compensate for this, the LRA is given the authority to set the agenda for the RA meetings. The idea was that the majority party sets the agenda, but the other parties can easily vote down any motion they dislike. In the new assembly, however, members of the minority parties, lead by ThePrincess Parisi of NuCARE and Beathan Vale of the Simplicity Party, immediately began challenging this traditional role of the LRA, and proposing procedural changes. In addition, ThePrincess spiced up these procedural debates with a liberal dose of name-calling and personal attacks on the LRA, Patroklus Murakami. "It has become clear since the recent elections that there's a minority in the RA that is determined to prevent me from chairing meetings as LRA. I have not always responded well to the challenges of chairing meetings under these circumstances and I apologise to the CDS community for my faults in this regard." The withdrawal of the CSDF representatives from the RA had two immediate consequences. One was to give the voting majority to the alliance between NuCARE lead by ThePrincess and the Simplicity Party lead by Beathan (Brian Livingston, the leading candidate of the Simplicity Party, unexpectedly resigned from the RA himself, shortly after Pat did). The second consequence was to provoke an interim by-election to replace the CSDF representatives. CSDF has decided to present candidates for this by-election, with the hopes of gaining back one of the two seats they had given up. It was Pat's resignation that caused me to become involved in the disputes. First, I got to thinking about how it was that this region, which had been so painstakingly built up by the voluntary contributions of one group, could now so easily be taken over by a new hostile group. This lead me to start a forum thread called Collective Property vs Un-Gated Community, in which I argued that having collective property in an un-gated community inevitably leads to the tragedy of the commons. And secondly, I was irritated to see ThePrincess, whose attacks had caused my friend Pat to withdraw from his seat on the RA, crowing about how rosy the situation was in CDS. So I said as much on the thread she had started, and that she had called WHATS UP WITH CDS? I'LL TELL YOU WHAT!. The conflict escalated. Profiting from the absence of CSDF, the new majority passed a series of highly controversial measures, as Patroklus describes on his blog, in a post entitled Virtual Zimbabwe. Patroklus also opened a thread on the CDS forum, called Catalogue of Abuse, in which he reminded everyone that the main factor that had prompted his resignation was the treatment he had received from ThePrincess. I found Pat to be far too mild in his own defence, so I jumped into the fray. I wrote a comment on this thread saying that in my opinion the behaviour of ThePrincess is that of a troll and a griefer. And when all of her associates jumped up to defend her, I replied that those who defend a notorious griefer become griefers themselves. And to think that only a few months ago I posted a cheerful account of the in-world marriage of ThePrincess and MT. I found myself suddenly in the very thick of the fray. And I realized that I had forgotten to check with anyone from CSDF about my outburst on the forum. But I had for some time been toying with the possibility of creating a new leftist faction within CDS, one that might be less bound by the weight of tradition than CSDF, which is made up of many of the historical pillars of CDS. So I announced in a post on the CDS forum my plans to create a new faction. My announcement received one reply, from Dnate Mars, who said only: "I wish you the best of luck!" Since I perceive Dnate to be closer to the alliance between ThePrincess and Beathan, than to CSDF, I get the impression that his comment may have been a bit sardonic. But I replied good-naturedly: "Thanks. I'll need it!" So here I am condemned to try to build a new political party within CDS. 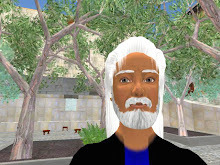 My other Second Life projects, such as the promotion of Ivan Illich's philosophy, or the organisation of a Second Life Parliament, are pushed to the back burners. I've begun to make the rounds of all of the various "progressive" regions of Second Life, such as Commonwealth Island, Better World Island, Cedar Island, and so on, in search of possible new members for my new party. I'll tell more about that on my next post. But one little piece of information will give you a foretaste of how my search is going. How many possible new members have I found so far, you may ask? The answer is quite simple: zero. A lot of your ideas are interesting. That's not to say they are right, or even good - but certainly interesting. I get a lot of ideas myself, but usually most of them fail the 'is it any of my business' test. I find most people on the electronic frontier are willing to band together when there is clear, overwhelming common interest - but once it's less than clear, off they go. Choosing autonomy over cooperative benefits, and I think... rightfully so. The mechanisms that will work on the grid have to roughly align with realities. For instance, there is a sort of quasi-democracy. Sadly, it seems to be: one $L, one vote. Regardless if that $L is brought in via RL work, or earned on the grid. An unfortunate sort of democracy, but real enough... if it is in fact truly a democracy at all. The only thing that thwarts the majority in such cases is the ability to say no to dollars; to not sell a region or a system of governance out at any price. But it's a weak check or balance - not one that necessarily is tied to morality or ethics. Perhaps I've mischaracterised this or missed a point... that's a matter of debate. But until such fundamentals change, whatever they are, everything built upon them has to either reconcile the base facts or be propped up artificially. Eventually the dam will break. I wish you well with your CDS faction. Maybe it won't come to fruition now... but that's not to say it won't ever. In fact, if you quietly discussed with people and found out what made sense to most of them... I'll bet you would be able to launch a truly formidable faction out of seeming thin air in about 2-3 months. That's the ugly thing about politics. There's honour, and there's playing to win. Not always running parallel, but not always running separate either. It's spending. Spending time to gather grass roots support; spending money on exposure. Regardless, I wish you well with it; I'm sure it would be refreshing, and further the experiment of the CDS greatly in any case. In RL democracies, whilst spats and in-fighting happens, it's almost always counter-productive. Real politics is much less 'in-your-face' and much more 'under-the-radar'. It's best to work on the grass roots and key players, schmoosing and dealing to get the level of support needed to make the movement all but unstoppable. But I don't know much about politics in SL - all this arguing and falling out seems a waste of time when there already is a governance system in place - Linden Lab and their TOS. They own the grid and they own your sim so I don't see what good all this democracy stuff does when you can't affect the world at large, just who lives where in your small part of it and how the village green looks. I don't want this to seem dismissive or flippant, it's just I really don't understand what you guys are doing and why, I guess. It seems like the various SL Police Forces you see around - just roleplaying with lots of factional in-fighting due to a lack of a dedicated system-wide structure to support such roleplaying. Thank you for your thoughtful comments. As you note, people band together on the electronic frontier when they find a clear common interest. But as Clay Shirky suggests (see his article “A Group is its Own Worst Enemy”), the success or failure of an online community depends on something like what the Calvinists called “divine grace.” If the chemistry is right the users stay, otherwise they go off to the next hot application, like internauts massively migrating from MySpace to the new El Dorado of Facebook. And it is true that money speaks, on the grid as in RL. You may have noted that Prokofy advocates frank recognition of the power of money, advising that any in-world democracy should be restricted to landlords (that is in fact the case in CDS, where the principle is “one landowner = one vote”). Prokofy’s main demand currently seems to be that there should be a representative of all SL residents on the LL Board of Directors, although that is hardly a substitute for some kind of in-world democracy. As for the faction I am trying to create, it would be an attempt to present a minority point of view. Up until now CSDF, which is the main leftist faction in CDS, has often been the majority party, and in its struggles with other factions it has played to win. While it is legitimate to play to win in a democracy, to be fair we should recognize that Gwyneth Llewellyn as a main pillar of CSDF has always focused primarily on maintaining a sense of community within CDS. All parties within CDS have a responsibility to maintain that sense of community, but I dare to think that a minority party could also openly speak its mind about sensitive political issues involving the greater world outside of our virtual utopia. It is worth a try. I think I understand what you are saying about RL politics. They are really more about working slowly and carefully behind the scenes to develop alliances, a communications strategy, grassroots support and so on, rather than the visible in-your-face aggressive debating which so easily degenerates into name-calling. It’s true that I myself have been calling people names such as “troll” or “griefer,” maybe to the detriment of grassroots organizing. But some kind of policing of behavior is necessary, though I would prefer to call it “moderating,” as in the classical role of the moderator on the internet forum. More generally, we often hear it said that CDS is just carrying out democracy “role-play.” If you recognize the legitimacy of in-world property and commerce, however, you should also recognize the legitimacy of in-world government. But police-force “role-play” is more controversial. Thus Prokofy opposed the efforts of resident vigilante groups who took it upon themselves to fight griefers. It should be up to the Lindens to define and enforce the regulations necessary to protect residents.